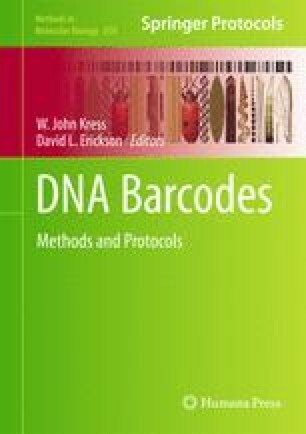 This chapter describes methods currently used for DNA barcoding of fungi, including some comments on the barcoding of aged herbarium material. The collecting procedures are focussed on macro-fungi. The laboratory methods are for medium-throughput DNA barcoding, targeted at the 96-well format, but without the assistance of robotics. In the absence of an approved and standardized DNA barcoding locus for fungi, the chapter outlines the amplification and sequencing of nuclear ribosomal genes, ITS, and LSU D1/D2 which are most widely used for the identification of fungi from diverse environments. My former colleagues from the Department of Forest Mycology and Pathology at the Swedish University of Agriculture Science in Uppsala, the members of the Genome Center of Uppsala University, and my current colleagues from the CBS-KNAW Fungal Biodiversity Centre (Centraalbureau voor Schimmelcultures) in Utrecht have contributed over the years to the protocols and experiences assembled in this chapter. Their contributions are greatly appreciated.